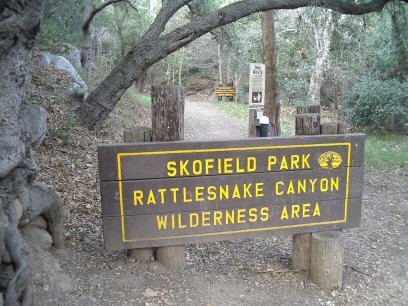 Somewhere along the windy bit that is Las Canoas Road off of Mission Canyon Road is Skofield Park and Rattlesnake Canyon, which is apparently part of Skofield Park. Start of the trail up Rattlesnake Canyon. Well, the one one the west side of the creek, anyway. This trail is an old standby from childhood. That is, we must have been on the start of this thing at least a dozen times. As is typical of front country trails, continuing on the trail can be a challenge at times. A little ways up, the trail goes straight while a bulldozer width trail turns right up the hillside. It goes a short way up to a road and fencing and, believe it or not, a bulldozer. There's an okay view from it too. 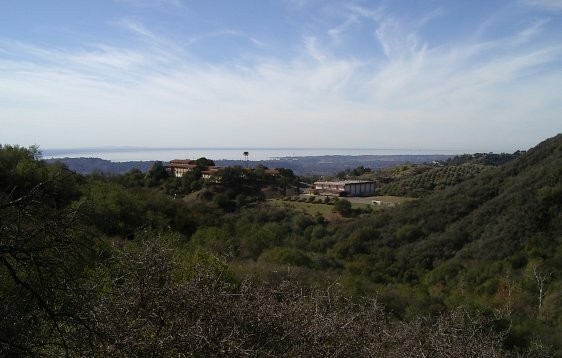 A short offshoot of trail leads to a view of some of the city below and St. Mary's Seminary.